Goose hunting can be an incredibly rewarding sport that requires great skill, and the most challenging aspect is working yourself into a position from where you can have a good shot at the birds. For this purpose, it is essential to build a blind, or some other shelter you can hide in as you await the arrival of the geese. A goose blind made out of cornstalks can be extremely effective, as this is easily camouflaged in wide open hay fields or cornfields, giving you the perfect hiding spot. To begin, you will need to build a square or rectangular frame that is 12 feet long by 6 feet wide by 4 feet tall. This can be constructed using PVC piping and connectors – connect a 90-degree T connector with 12-foot lengths of piping, and then proceed to connect the Ts together by using the sections of 6-foot pipe and 4-foot pipe. The frame for the goose blind is now ready, and should be placed in an ideal location which is bound to attract lots of geese, such as a cut cornfield. Next, begin covering the frame with cornstalks. Stack the cornstalks up against the PVC frame you just constructed, and use strong wiring and the pliers to secure the cornstalks to the frame. Continue doing this until the top and bottom sections are entirely covered. 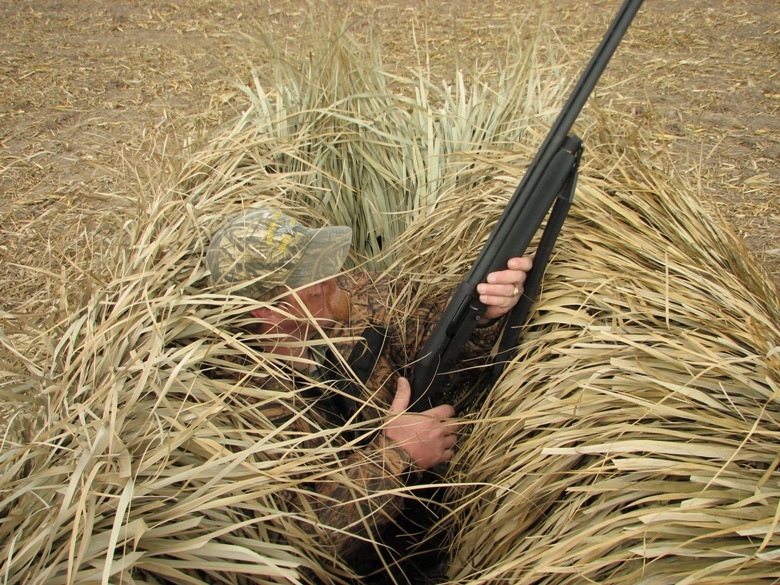 Make sure you bunch lots of cornstalks up together, to ensure maximum coverage – all four walls of the goose blind should form solid, thick walls of cornstalks. Leave a small fold open at the back of the goose blind – this will serve as an entrance for you, and you can use this opening to slide a small bench inside. Then, crawl into the blind, and sit down on the bench. Call as you await the arrival of the geese, and when they land, you can simply stand up straight, and enjoy full range of motion to swing your rifle as you shoot your pick of the lot. Make sure you store the goose blind carefully once you are done, as this can be used multiple times.